What’s the difference between the Database, the Catalog and the Library? Why a database rather than a browser? Do I have to import my photos? Can’t I just browse to view them? Do I have to export my photos? Why can’t I just save them? Is there a maximum file size that Lightroom can import? Why do I have 2 different files for my catalog? How do I create a new catalog and then switch between catalogs? I don’t want to use Lightroom as an asset management program, just as a raw converter. Can I use a separate catalog per job? I’ve decided I’m going to have my photos in one large working catalog, but then I’d like to archive the job off into an individual catalog for archival storage. How do I export to a small catalog? I’ve decided to use a smaller working catalog, but then import into a large searchable archive catalog when I’ve finished working with them. How do I transfer them from one catalog to another? When I used ACR I only kept the XMP files archived – can’t I just do that? I need to work on my photos on my desktop and my laptop – what are my options? I work on a single laptop and my photos are on an external hard drive – when I take my laptop out, but leave the external hard drive at home, can I continue working on the files? I primarily work on my desktop, but I’d like to be able to temporarily transfer part of my catalog to my laptop and then merge the changes back later. Is that possible? I like to upload into a catalog on my laptop when I’m out shooting and start editing – how can I move those files into my main desktop catalog when I return home, without losing the settings? Why haven’t my presets copied over with the catalog? Is it possible to have the catalog on a local drive, but the files on a network drive? I run my own backup system – do I have to let Lightroom run backups too? I haven’t got time to back up now – can I postpone the backup? How can I make it back up on exit instead of when starting? I need to wipe my computer – how do I back up and retain all of my Lightroom adjustments, preferences, presets etc? How do I move my catalog & photos to another hard drive manually or using Export as Catalog? How do I move only my catalog to another hard drive? How do I move only my photos to another hard drive? Should I convert to DNG on import? How do I bring up the Import window where I set the Import Options? I just get an Open dialog? How do I stop Lightroom from launching or opening the Import dialog every time I insert a memory card? Is it possible to import from multiple cards at the same time? What’s the difference between ‘Import photos at their current location’, ‘Copy’, ‘Move’, and ‘Copy as DNG’? I’ve chosen ‘Copy’ or ‘Move’ – how do I organize them into a folder structure that will suit me? What does the Backup option do? How do I set up the File Naming to my chosen format? What does ‘Do not import suspected duplicates’ do? What Develop Settings, Metadata, Keywords and Previews settings should I apply in the Import dialog? How do I set up Lightroom for Tethered Capture? Why isn’t my Watched Folder working? I shot Raw + JPEG in camera – why have the JPEGs not imported? I can’t see thumbnails in the Import dialog, I just see grey squares. How do I ?x it? Lightroom can’t find my camera to import the photos. How can I import? Lightroom can’t import the photos from my brand new camera – why? It says “Some import operations were not performed. The files already exist in the catalog.” What does this mean? Is there a limit to the number of photos that can be imported in one go? Lightroom appears to be corrupting my photos – how do I stop it? Lightroom is changing the colors of my raw files – how do I stop it? When I import JPEGs, they change color too, and that’s not due to a difference in raw file rendering… what could be happening? How can I choose the information I see in the thumbnail cells? What are Badges and why can’t I see them on my photos? What do the different Metadata Icons on the thumbnails mean? How do I turn off the overlay which says Loading… or Rendering…? What is the difference between the solid white arrows and the opaque ones in Folders panel, Collections panel and Keywords Panel? How do I zoom in on a photo quickly? How do I change the zoom percentage? Is it possible to change the fonts and other interface details? How do the folders in Lightroom’s Folder panel relate to the folders on my hard drive? What do the small symbols alongside the folder counts mean? Lightroom thinks my photos are missing – how do I ?x it? In the Library Panel, Lightroom has a Missing Files collection – but those files aren’t actually missing, and they open in Develop. How can I clear it? I need to move some or all of my photographs to a new hard drive – how an I do so without confusing Lightroom? How can I find the original file on my hard drive? How do I select and deselect multiple photos? Why don’t the rest of my photos deselect when I click on a single image? Is there a quick way of selecting all photos with a specific color label? I’ve got multiple photos selected – why is my action only applying to a single image? How do I rename photos? What’s the difference between Import#, Photo# and Sequence#? How do I add a space into my new file name? Is it possible to revert to the original filename? When I delete photos, am I deleting them from Lightroom only, or from the hard drive too? Why can’t I delete photos when I’m viewing a collection? It’s taking forever to delete photographs – should it really take this long? I turned off auto rotate in the camera by accident – how can I rotate photos easily? My photos have imported incorrectly rotated and distorted – how do I ?x it? Are there any shortcuts to make rating and labeling quicker? I’ve flagged my photos, but the flags disappear when I view these photos in another folder or collection – why? Why would I want flags to be local instead of global? I gave my photos color labels in Lightroom – why can’t I see them in Bridge? I gave my photos different color labels in Lightroom – why are they all white in Bridge? I labelled my photos in Bridge – why isn’t Lightroom showing my color labels? Lightroom’s not quick enough to do the initial culling on a large shoot – is there anything I can do to speed it up? If I can import keywords using a Text File, does that mean I can create my keywords using a Text File and then import them into Lightroom? I mistyped a keyword and now Lightroom keeps suggesting it – how can I clear the auto?ll? Is there any easier way to apply lots of keywords in one go, other than typing or dragging them all? How do I view photos just with a specific keyword or keywords? What do the minus symbol and check mark to the left of the keyword arrow mean? I use multiple catalogs, but I’d like to keep my keyword list identical and current across all of the catalogs – is there an easy way? What is the Painter tool useful for? The time on my camera was incorrect – how do I change it? What do the different options in the Change the Time Stamp dialog do? How do I sync the times on 2 or more cameras? How do I add my Copyright information to the metadata? I renamed my photos within Lightroom – is it possible to see the original file name without renaming it? Why can’t I see the file size in the Metadata panel? What’s this WAV file in the Metadata panel? Some of my lenses are listed twice in the Metadata Browser, for example 24.0-105.0 mm and also as EF24-105 IS USM. Why? I’ve just created a virtual copy, but an empty screen appears with “no photo selected” and no copy is made – what’s wrong? I’ve moved Raw + JPEG photos into the same folder, and I’d like to Auto-Stack just like they would if they imported as Raw + JPEG together. Is it possible? When I create a virtual copy, it should automatically stack them, but it doesn’t – why not? Where have my photos gone?! Can I set a default filter or sort order regardless of folder? How do I choose a different sort order? Can I reverse my current sort order? Why can’t I drag and drop into a custom sort order or ‘User Order’? Is it possible to sort by camera? How do I sort my entire catalog from earliest to latest or vice versa, regardless of which folders the photos are in? How do I filter my photos to show… photos with no color label? How can I use the Find Panel to do AND or OR filters? How do I select multiple options within the Metadata Browser? Can I combine different filters? Is it possible to display all of the photos in a catalog that are not already keyworded? What are the different icons for Collections? What is the Quick Collection? Is there a shortcut key to add to a collection? Can I add to a collection from another module? Why won’t it delete the photo? Is there any way to tell which collections a photo is in? Is there an easy way to see which photos in a catalog do not belong to any collection? Can I adjust Sharpening or Saturation using Quick Develop? Why won’t my thumbnails display? I only get grey boxes in Grid view? The slider movements are too coarse – how can I adjust them? How do I get individual auto checkboxes back, like ACR had in CS2? Can I toggle a Before / After view, like the Preview checkbox in ACR? Can I see Before / After side-by-side? Can I detach the panels to rearrange them in the order I like? Can I change the RGB values from percentages to a normal 0-255 scale? Is it possible to see clipping warnings? Where does Lightroom store presets? Why are they not in the default location? How do I apply a preset to multiple photos in one go? Can I apply multiple presets to the same file, layering the effects? I have some Develop presets that I use in ACR in CS3 – can I use them in Lightroom? Does changing the default settings in Lightroom affect ACR? How do I reset a single slider to its default setting? How do I reset a panel to its default setting? How do I reset an image back to default settings? How do I reset multiple photos back to default settings? The Reset in Develop only works on one image? If I don’t like the last adjustment I made, can I just undo that step, rather than using Reset? Can I undo multiple steps? Is the history saved in a sidecar XMP file? The White Balance Eyedropper disappears every time I click anything – how do I keep it turned on? Fill Light drops the contrast too far – is there an easy solution? Why are Contrast & Brightness set to 25 & 50 by default, instead of 0? Why doesn’t the Vignette adjust to the Crop boundaries? I want to use a Point Curve, but only Parametric Curves are available in Lightroom. Is it possible? What do the three triangular sliders docked at the base of the Tone Curve display do? I’ve turned sharpening right up to the maximum, but it doesn’t seem to be doing anything – why not? Why can’t I view sharpening in Fit to Screen mode? Why isn’t Lightroom’s sharpening very strong? Why can’t I see the effects of the noise reduction? Is it possible to use plugins such as Noise Ninja or Neat Photo to reduce noise? How do I use the TAT tool? How do I turn off the TAT tool when I’ve finished using it? Where did the Crop Options go? How do I crop a vertical portion from a horizontal image? How do I set my crop grid back to thirds or bring the grid overlay back when it goes missing? Is there a way to see what the new pixel dimensions are (without interpolation) of a cropped photo before it’s exported? How do I work the Red-Eye tool? Lightroom’s Red Eye tool can’t lock on to the red eye – is there anything I can do to help it? Why doesn’t the Red Eye tool work properly on my dog’s red eye? How do I adjust the cursor/brush size? How do I adjust the size of an existing spot? How do I move an existing spot? How do I delete a spot? I’ve somehow removed the toolbar with the crop/red eye/spot tools from my Develop module and can’t find a way to get them back where they should be. Help? Why do my photos change color? When the first preview appears, it looks just like it did on the camera, and then that disappears and it applies other settings. How do I turn that off? I set my camera to black and white. Why is Lightroom changing them back to color? How do other programs like iView, PhotoMechanic, Apple’s Preview, Windows Explorer, Breezebrowser etc. get it right? My Canon raw files exhibit an odd shift particularly in the red tones – can I ?x this? I have calibration settings in ACR which I’d like to use in Lightroom. How do I import them? The ACR version number in the Calibration section is an old version – how do I update it? Why would I want these settings written to XMP? Which data is not stored in XMP? Where does Lightroom store the XMP sidecar files? So should I turn on ‘Automatically write changes into XMP’? While updating the DNG Preview, can I change the size? Should I check or uncheck “Include Develop settings in metadata inside JPEG, TIFF, and PSD files”? XMP has been updated on another program/computer. Why don’t the changes show in Lightroom? So does that mean it’s possible to share settings between computers using XMP? Which settings are not backwards compatible for CS2? Lightroom throws an error saying it can’t write to XMP – how do I ?x it? I deleted the XMP sidecar files and now Lightroom won’t write new ones – how do I force it to write them? What’s the difference between Export and Edit in…? Can I have more than 2 External Editors? Can I open a raw file directly into ACR without creating an interim file. Is it possible? I’d prefer to let Bridge run the conversion to JPEG using Image Processor. Is it possible? What’s the equivalent of a JPEG quality…. In the Edit with Photoshop dialog, should I choose TIFF or PSD? I am a high volume photographer (weddings etc) – do I HAVE to convert to PSD or TIFF for light retouching, or can I use JPEG? Why do my photographs look different in Photoshop? I set the export PPI to 300 – why is it 72ppi when I open it in Photoshop? How do I change the PPI setting for Edit in Photoshop? When I crop to 8×10 in Lightroom and then open in Photoshop, why is it not 8″x10″? Can I export to multiple sizes in one go? Can I set Lightroom to automatically export back to the same folder as the original, or a subfolder of the original folder? Can you ‘Apply sharpening to preview photos only’ like you can in ACR? Can I set Lightroom to automatically reimport the exported files? The droplet runs, but it doesn’t save – what have I done wrong? The droplet runs, but it keeps asking what JPEG compression to use – what have I done wrong? The droplet doesn’t run at all – why not? The droplet only works on some of the photos and then stops – what’s wrong? In my droplet I used a Save for Web instead of a standard Save As – why won’t it overwrite the original file? How do I install Export Plugins? What Export Plugins are currently available? How do I use Export Plugins? How do I enter the details for the Copyright Watermark? How do I change the font or size for the Copyright Watermark, or use a graphical watermark instead? Do I have to wait for Lightroom to finish updating the previews before I can export? Why does Lightroom move my Edit with… photo to the end of the sort order? Why is Lightroom flattening my layered file? Why does my Edit with… PSD file not have a preview when it’s returned from Photoshop to Lightroom? Lightroom can’t find Photoshop to use Edit with Photoshop – how do I ?x it? It gives an error message – “An error occurred while exporting.” What went wrong? Why can’t Lightroom find all of my music? Why can’t I find the Shadow checkbox and settings in the Overlays panel on my PC – I’ve seen it on some tutorial videos? Can I export with my choice of music? I exported to PDF, but it doesn’t automatically start the slideshow when I open it. Why not? Why does it get part way through the slideshow and then start back at the beginning? Why is my Noise Reduction not applied to the slideshow? Everything appears to be running correctly, then the screen just goes blank grey or black when I try to running the slideshow. How do I put the filenames and a copyright watermark on my contact sheet? With 1 image on a sheet, I can place the ID plate anywhere. Is that possible for multiple photos? How do I set up my printer to match the image I see on screen? Why are Lightroom’s prints too dark? How do I get Lightroom to see my custom print profile? The default ?ash gallery appears to be capped at 500 photos, but I need to include more – how can I change the default? How can I save certain settings to a default gallery template, such as ID plate and color settings? How do I upload my gallery to .Mac? Why doesn’t the FTP upload work – it says “Remote Disc Error”? I have a problem with Lightroom – are there any troubleshooting steps I can try? My toolbar’s disappeared – where’s it gone? How do I change the tools that are shown in the toolbar? Where’s the Close Window button gone? Can I change the panel auto hide options? How do I create Identity Plates? Where has my Identity Plate gone? What size and quality should I set for Standard Previews? Is there any way to make it render thumbnails quicker when I’m scrolling through Grid view? Lightroom’s slow in moving from one photo to the next in Library module – is there anything I can do to speed it up? Lightroom’s slow in moving from one photo to the next in Develop module – is there anything I can do to speed it up? The previews folder is huge – can I delete it? If I delete the file, is the preview deleted too? Why do I have to create previews? Why can’t I just look at the files? The preview in Library is slightly different from the preview in Develop – why is that? Lightroom appears to be creating Cache*.dat files in ACR’s cache as well as its own previews – why? I uninstalled the program, but now I want to reinstall and it won’t let me as it says “A newer version already exists”. How do I uninstall cleanly to be able to reinstall? I installed Lightroom, but it says “An error occurred while attempting to change modules”. How do I ?x it? There’s a question mark in the corner of my thumbnail cell, and when I try to open the photo in Develop it says “The file cannot be opened”. Why not? I tried to open my catalog but it says “The Lightroom Catalog at *** cannot be used because the folder does not allow files to be created within it.” How do I open my catalog? When I use the browse function to locate a folder, the Windows Live Login dialog pops up. If I don’t log in, Lightroom stops responding and I have to restart. How can I stop this? My catalog appears to be corrupted – how do I rescue it? I’ve renamed the files outside of Lightroom and now Lightroom thinks they’re missing. I’ve lost all of my changes! Is it possible to recover them? I renamed my photos inside of Lightroom, but I’ve accidentally deleted those renamed files from the hard drive. I do have copies of the files on DVD, but they have the original file names, so Lightroom won’t recognize them. Is it possible re-link them? Lightroom doesn’t show me a preview of my PSD file in Grid view – why not? I have a huge problem! I accidentally deleted my photos from my hard drive and I don’t have backups! There are 1:1 previews in Lightroom’s catalog – is there any way of creating JPEGs from the previews? Lightroom has slowed to a crawl – how can I speed it up? How do I change Lightroom’s memory management? Does Lightroom use multiple cores? I’ve heard of incompatibilities with nVidia graphics cards and software – is there anything I can do, other than using a different graphics card? Lightroom Develop settings embedded. How do I ?x it? I’m switching from PC to Mac – how do I switch my Lightroom license? 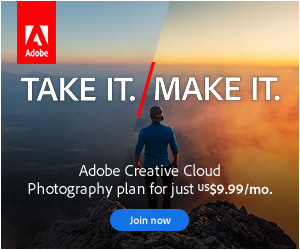 Is the download on Adobe’s website the full program or just an update? I’m having problems accessing the Adobe website to download the update – can I download it elsewhere? I’ve heard there’s an Pirate-themed Easter Egg – how do I find it?